Perennial. Zone 2. Asteraceae. Europe, “from the Ardennes in Belgium south to the Pyrenees in Spain and east to Poland and Yugoslavia, growing in subalpine meadows and open woods, flowering in May-July”, according to the reliable Roger Phillips and Martyn Rix, in their two-volume masterwork, The Random House Book of Perennials. This is a clump former which spreads to 2 feet or so in diameter where happy, depending on stoloniferous underground stems to slowly expand its girth every year. Though not exactly shy about advancing on its garden neighbours, it is easy to keep in check in the garden by some judicious trowel work in the spring. Deep green, silky-haired, broadly lanceolate leaves alternate up the multiple sturdy stems, which are topped by numerous black-bracted buds. 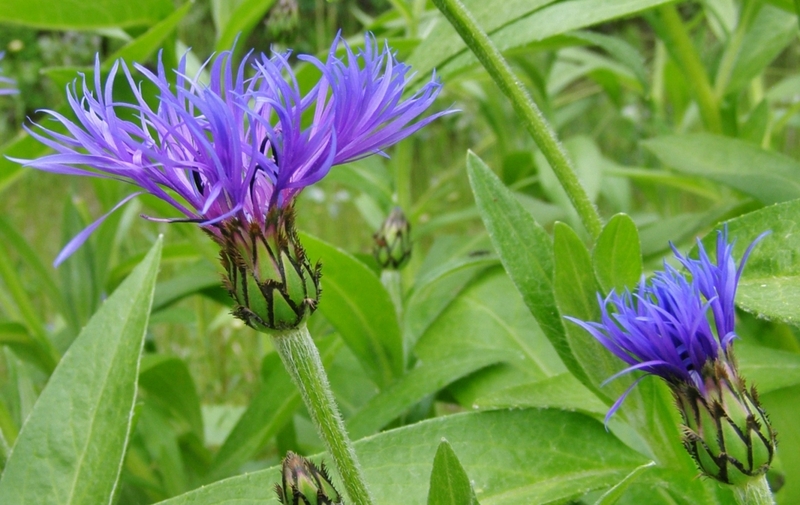 These open into large, electric blue cornflowers in late May, and continue well into July. Some years the plants may “bird’s nest” in heavy rainfall. If this happens, ruthlessly shear the whole plant back to 6 inches or so, and tactfully ignore it for a week or two; it will quickly recover and regrow into a much more tidy clump, and will usually rebloom later in the season. 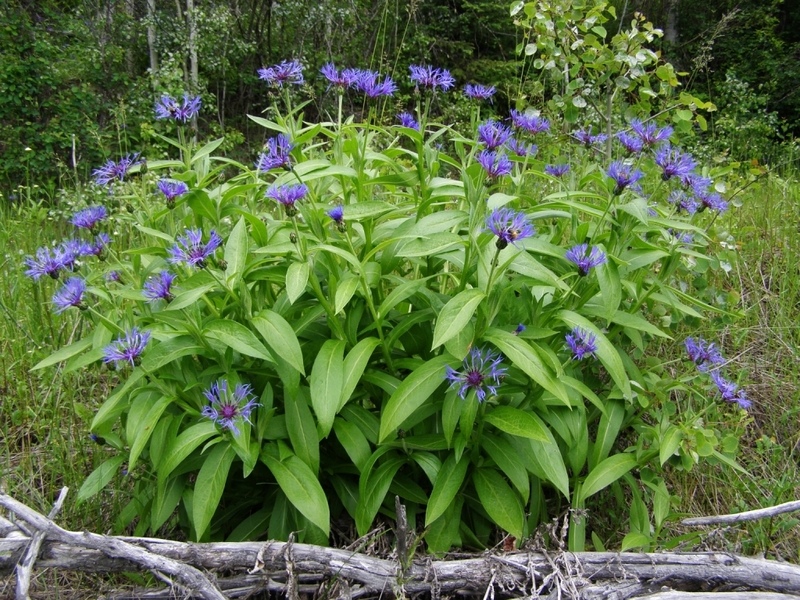 An excellent bee plant and attractive to numerous species of butterflies. Early in June…and for almost a month, 2½ foot stems rise up, carrying the many dark blue thin-petalled blossoms that always remind me of little jets of flame. Perennial cornflowers look best set in groups of three or more – a single plant makes little show – just back of front [in the border] in company with poppies, irises of any colour, dianthus and the like…They might be left out of smaller garden in favour of something showier…but are a good choice for next-to-no-maintenance flowerbeds that could include Siberian irises and daylilies. 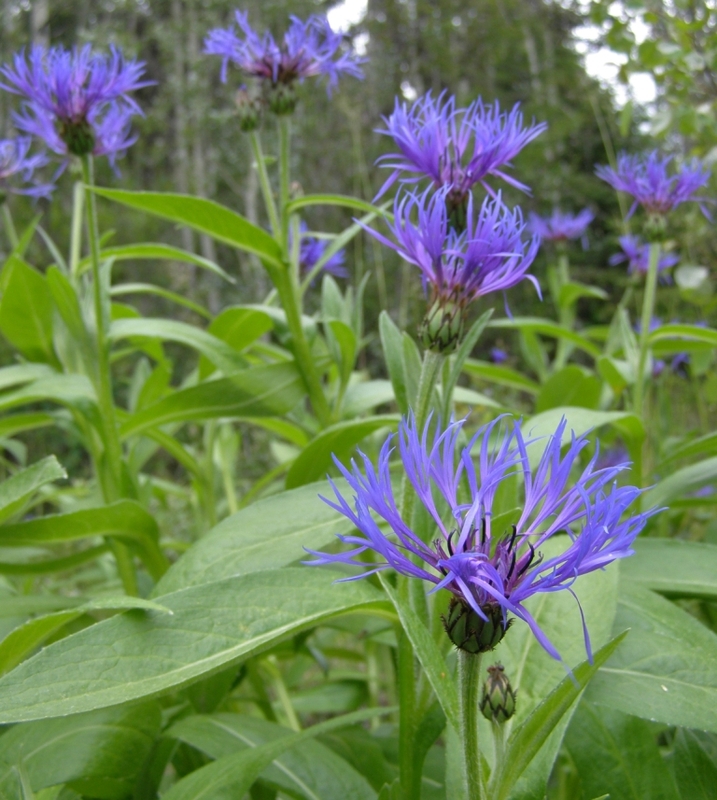 This Centaurea will be very familiar to those who garden in the Quesnel and Prince George regions, as it thrives in the cool, moist subclimates of the aspen-forested areas, and in some places has escaped gardens to form thriving naturalized colonies along road edges and in ditches, where it is very lovely in its long bloom season. There are some handsome specimens growing in Wells-Barkerville area gardens, and it grows up on the hillside behind the Barkerville Heritage Site buildings, where it coexists quite nicely with native lupines, Indian paintbrush (Castilleja), arnica and wild valerian. The invasive plant people are keeping an eye on it, being concerned that it might some day become a pest, but I am not overly worried about it, as it has been grown in our region for well over a century, and its “naturalization” appears to be confined to areas of disturbed soil, or places where there have been previous gardens. In my own microclimate it has in fact proved rather difficult, apparently not caring much for my clay soil and sun-baked summers. Sun to light shade; average soil and moisture. Very long-lived.